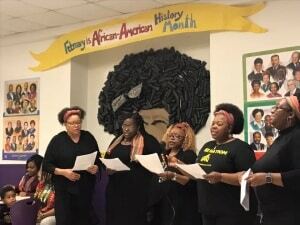 Division-wide, many events and activities were planned to celebrate Black History Month ranging from classroom decorations to special morning announcements to Soul Feasts and assemblies. 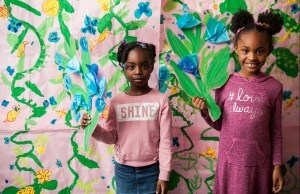 At Johnson Elementary School, second grade students created a backdrop for a Kehinde Wiley-inspired photobooth for African American Heritage Night. Thanks to our talented second graders for creating the backdrop and our parent photographer John Robinson for capturing these beautiful photos. See the photo album here. At Buford Middle School, students heard from Charlottesville-area residents that participated in the summer’s Charlottesville Civil Rights Pilgrimage to Montgomery, AL. For news coverage, click here. Meanwhile, Rachel Wilson’s photography classes at CHS produced a project to showcase “Self Expression through Hairstyles” using portraits and motion GIF files of students and staff at CHS. See the video here. 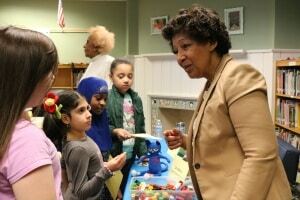 Dr. Rosa Atkins attends the Career Showcase at Burnley-Moran Elementary School. Burnley-Moran hosted a Black History Month Celebration and Career Day that featured a drumming assembly along with a showcase of African-American leaders from throughout our city. Last year’s event brought more than 40 local professionals together–many of them CHS alumni. Here are a few photos from this year. Clark staff members provide entertainment during the school’s annual Soul Feast. Like several of our schools, Clark Elementary held its annual Soul Feast, which featured a full menu of fried chicken, collards, and more. This year the “Ladies of Soul” (all Clark staff members) gave a special performance. CHS hosted its annual speaker series featuring a variety of guests like documentary photographer Ruddy Rowe. Additionally, CHS hosted a film screening to tell the story of Drewary Brown to a new generation of Charlottesville residents, and CHS’s African-American history students visited Jefferson School for a special program with Monticello and other community partners. 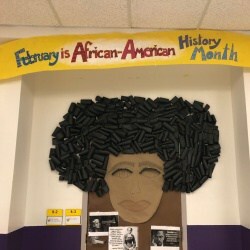 CHS teacher Christen Edwards decorated her classroom door for Black History Month. 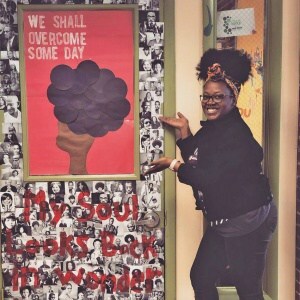 Meanwhile, we want to applaud the efforts of our teachers, librarians, and World History Coordinator Annie Evans for their year-round work to incorporate local and African-American history across the curriculum all year long. From preK-12th grade, our students encounter diverse voices, stories, and experiences in classroom materials, the arts, and student activities. Charlottesville City Schools is one of six school systems statewide involved in Changing the Narrative, a Virginia Humanities initiative that aims to explore black history and culture in schools and encourages young people of color to explore and highlight their heritage.